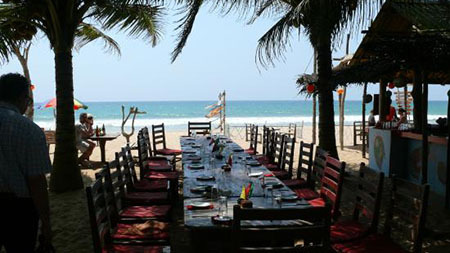 Awanhala Beach Restaurant‘s oceanfront location invites diners to chill out, sit back and relax. Service is friendly but laidback, and the setting is more rustic than fancy. 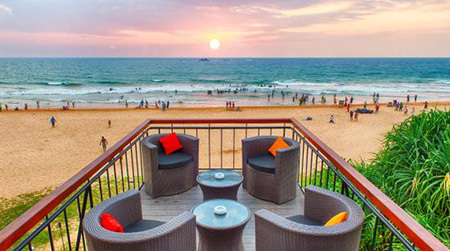 This does not make a dining experience here any less enjoyable – a meal at Awanhala involves plenty of salty sea breeze, watching the waves roll in and digging your toes into the sandy shores. Dine under the swaying palm trees, and grab a couple of drinks while you lounge back against the sunbeds. 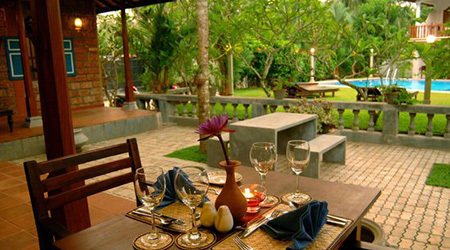 Dining alfresco is an obvious choice at Aida Ala Carte Restaurant. The best tables in the house are the ones lining the deck, providing a great view of a serene lake and tropical greenery. These seats are well-contended ones, so be sure to make an advanced booking for the outdoor tables. The seafood fare at Aida’s are a popular choice; give the shark steak and garlic prawns a go. If you are looking for something sweet to round out your meal, order servings of the Ceylon cup, a treat made with coconut, rum, and ice cream. 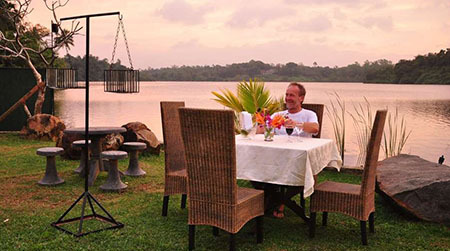 A night of fine dining awaits at Bentota Lake Restaurant. A versatile menu dishes up a variety of meal options – if you want something light on the stomach, go for the salads or sandwiches. Otherwise, take your pick from a selection of flavourful mixed grill dishes, Indian or Sri Lankan fare. The restaurant’s picturesque setting makes it a pity if not to dine outdoors, so enjoy a dinner under the starry night sky in the well-manicured garden, or tuck into an intimate meal in the middle of a serene lake. 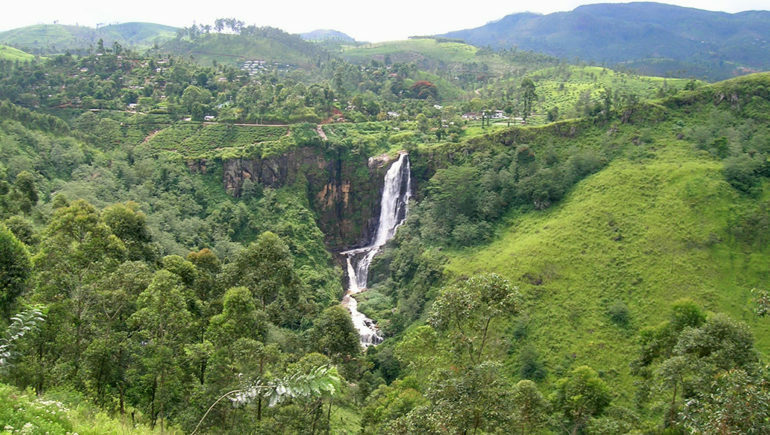 A vacation to Sri Lanka is not complete without a discovery of one of its most well-known produce, so make time to stop by at Chaplon Tea Center. The colonial-style decoration of the tea center offers an atmospheric setting for a tea break. Spend a lazy afternoon relaxing against the wicker chairs, and try out a selection of quality Ceylon tea in between bites of buttery biscuits. Diya Sisila Restaurant brings scrumptious seafood fare to the table, so be prepared to tuck into a fishy feast of dishes, like the lobsters with butter lemon and lobster curry, as well as starters of calamari and shrimps. Little variety to the dishes available is needed when the food tastes so good, so the limited menu is not a downside for most (except for vegetarian diners). Expect a waiting time of forty-five minutes to an hour for your meals to be ready. Enjoy a lovely dinner in an intimate setting at Golden Grill. Vaulted ceilings create a sense of spaciousness, rows of lamp vast a soft glow within and a scenic setting made up of lush tropical greenery and the scenic Bentota Lagoon lend a touch of romance. The friendly atmosphere, fautless service and welcoming interiors are plus points, but the star of the show is the delicious fare that Golden Grill dishes out. Fond favourites include the steaks, tuna steaks and mixed grills. Clink your glasses, sip your cocktails and watch the sun go down at The Loft. This gorgeous rooftop bar is the perfect spot for an evening of sundowners, food and engaging banter. Comfy armchairs, colourful cushions and petite coffee tables fill up the airy interiors, which are kept cool with gusts of sea breeze. Keep your hunger pangs at bay with a selection of tasty nibbles; unlike many restaurants in the country, service is prompt and dishes arrive in a timely manner. Mahesh, the genial manager of The Loft keeps the atmosphere welcoming and lively with his warm hospitality. Malli’s Seafood Restaurant wins over diners with its unique location and quality fare. 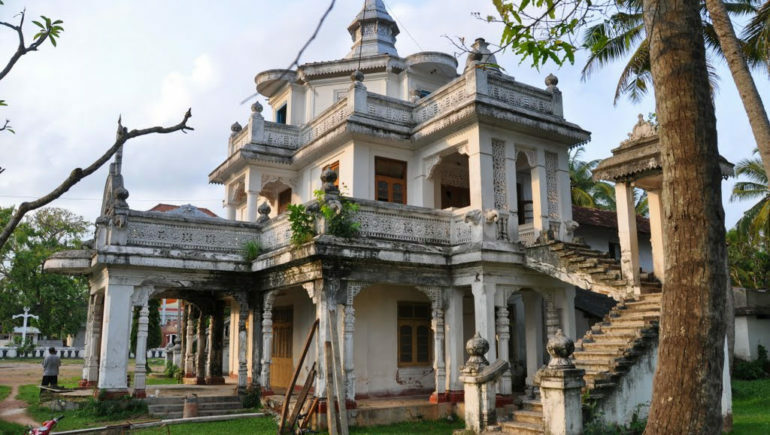 This quirky find occupies a spot on the platform of Bentota Railway Station, and overlooks a vast expanse of tropical greenery. 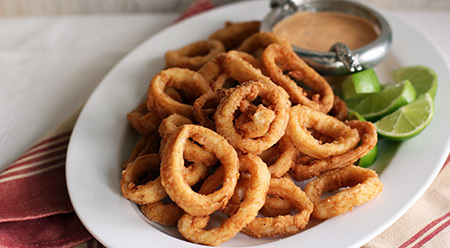 The menu does not boast an extensive selection, but what is offered is of top-notch quality; this is true for its seafood, meat and vegetarian dishes. The wholesome beet, orange and feta salad serves well as a starter, and the vegetarian curry is a winner. Cleanse your palate after a delightful meal with a refreshing dessert of pomegranate and ice cream. 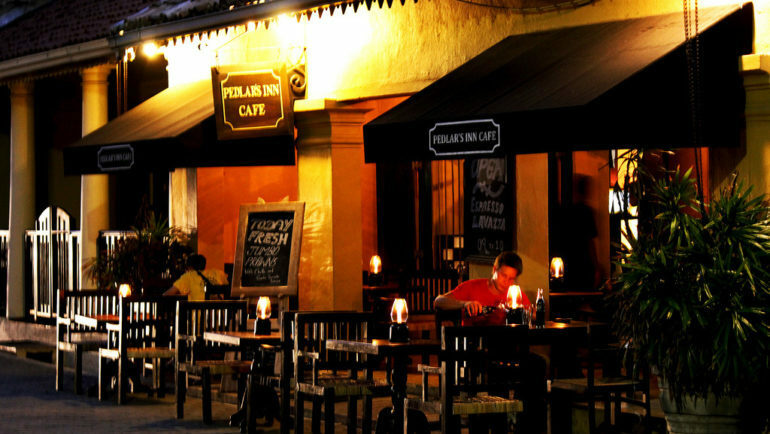 Panchi Villa Restaurant & Bar is an off-the-beaten-track find; diners will have to take a tuk-tuk or arrange for transport to arrive at the restaurant. Once here, you will find yourself in a charming and tranquil setting – the restaurant overlooks a pool, and is enveloped by a pretty and quiet garden. Service is prompt and pleasant, the dishes are palate pleasers and a good variety of well-made cocktails means that you should not leave withount indulging in a drink or two. 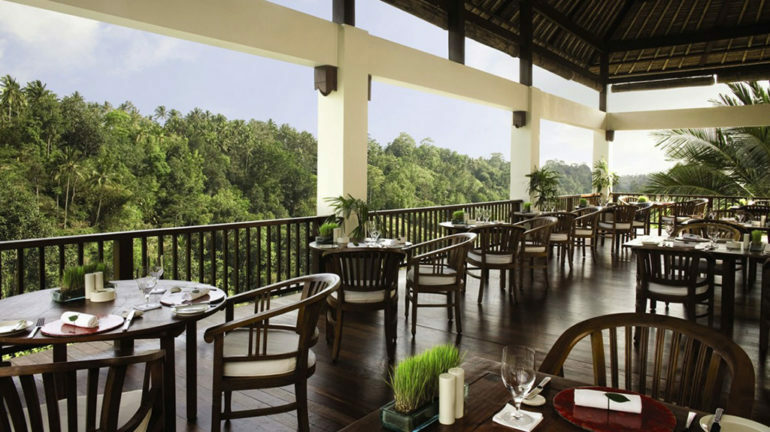 A meal at The Villa Cafe promises to be an excellent dining experience. Service is attentive and non-intrusive, the chef whips up a diversity of scrumptious and beautifully-presented dishes, and the eatery boasts a classy and elegant setting. The prices here are certainly higher relative to local eateries – but well worth paying for the quality fare and enjoyable dining experience.